Earnably Review: A Scam Or Legit Site To Earn Free Cash? Easily earnable income per month for all. For our long-term readers, Frugal For Less offers the opportunity for its writers to provide updates on income-generating sites and whether they stand the test of time in a fast-paced world. Earnably, a reward site with a largely positive reputation, was last reviewed in 2015, and I’ll be providing an update on what exactly the earning scape is today. The idea of earning for minimal effort and helping supplement those in need has always been a passion point of mine, so I hope you’ll find these rewarding as well. Like usual, we’ll take a look into the first impressions of the site, what the process is like, and whether or not it still seems like a worthy endeavor for your time. Three years can be like an eternity in the life of a reward site, so it’s important to note how exactly the site feels now for the new, growing client base. The first detail as a newcomer that you’re going to notice will be the blue. There just so happens to be an insane amount of blue that’s being utilized. Even some versions of the Earnably logo follow a gradient of blue. Normally color psychology doesn’t interest me highly, but the utilization of the primarily blue with bits of white struck me as noteworthy. It’s a standard template for many start-up professional websites, but it’s also been popularized heavily via social media platforms such as Facebook and Twitter. Curiously, if you look at the respective Earnably social media platforms for Facebook and Twitter, they blend together rather well. It shouldn’t be a shocking reveal that professionalism is an overt concern for any business that functions on retaining clientele. However, the curious relationship of designing it to look so familiar to standard social media platforms getting everyday use felt very deliberate. A desire to build instantaneous trust while also integrating in the user’s everyday routine felt a lot stronger with Earnably versus any other rewards-based platform I’ve reviewed thus far. The impression was distinctly unshakable, and I thought it wouldn’t leave as I went on with the analysis. The sense of trust building continued to come on incredibly hard as the first glimpse of the offer wall showed up. Every offer except one had a time window of four to five minutes with points earned ranging from seventeen to two hundred and two. For anyone that happens to use a lot of point-based reward sites, you’ll notice trends in how the more successful sites like to suggest that not a lot of effort is required to earn a good number of points in one go. If I were coming to view this as a layman with a slightly vested interest, I’d probably think that Earnably is offering me a massive deal right off the bat. The one counterexample provided is that of a 25-minute offer only rewarding sixty-seven points. 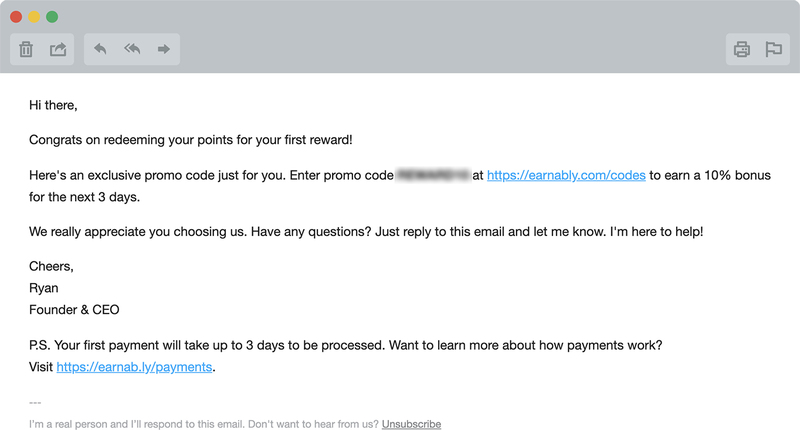 The Earnably website then wraps up with another inviting line of “easy, instant rewards.” We’ll discuss later how one might pause at the easy or instant component of the reward line. As the final one-two punch luring users in, Earnably kept it rather simple but effective. In terms of the initial offering of cards, Earnably offers a few from different categories. In the food and drink arena, Dunkin’ Donuts, Starbucks, BurgerKing, and Chipotle are offered. The online entertainment arena offers cards forSteam, the Playstation Store, the Nintendo eShop, and Hulu. If neither food nor entertainment entices you, Earnably also offers broader everyday life options such as Facebook, Barnes & Noble, and airbnb. Hovering any of these options, leads you to the sign-in page. Scrolling back, the same occurs with the offer examples, so there’s no wasting time if any visual element captures your attention. The following visual images are far less impressive since it’s merely up-to-date cases of people sharing a referral link via Twitter accounts. If you’re content with giving up control and you have friends that might join for the long haul then you’ll potentially benefit; it is a far less inviting prospect that suggests to the user that the site may not be quite as wonderful as it could be if it needs to front and center highlight friend referrals. With these things said, it should be pretty clear that an impressive amount of catch-bait was done for the new user experience on Earnably’s primary site. It takes about five to seven swipes to scroll to the bottom, so it’s not an excessively long amount of time for the user to make a judgment on the material before it. The next step going forward, however, is to see exactly how Earnably functions as a site for anyone that takes the plunge. The next part of the review will focus on the confirmation of Earnably as a pass-or-fail site for a new user. As an additional option, you can choose to sign up for emails from Earnably with the promise that you won’t be spammed. An example image is provided, and it largely matches the email experience that I’ve received in the time I’ve had an account. I received just one short email alerting me that there was a promotion running in December where everyday that you logged in you would receive bonus points. The amount for today was a tiny three-pointer (which is better than getting, say, a 1% bonus like I received on other days), but, for the amount of time it takes since it’s merely a simple click, it comes across as an okay offering for the holiday season when it works. At this time, the points are not actually registering as being added to the account. It’s a bit off-putting since it’s not tied to any offer and just a small miniscule amount offered by the site. Still, I imagine it follows the rule of other offers where you have to wait up to 7 days to see if they are credited—annoyingly enough. With that said, if you are inactive you’ll get a few more emails (about four within a month) from the founder asking you to reach out to him via Twitter or otherwise bait you into using the site. Additionally, you’ll get a promotional code to try and goad you along into using the site. I was given two promo codes—a 10% and 15% pair (START10and START15)—within about a 10-day span of each email. In terms of emails there’s not a lot that you’re blasted with. You’ll have to confirm your email after registration once. If you update your Internet browsers or otherwise sign-in from a new device, you’re going to end up with your account not being recognized. As a result, there can be some annoying confirmation emails with a security code that have to be handled. You’re provided with a six-digit security code,and you have to individually click each box to enter the digit or tab between them. It’s a small annoyance where you can’t literally type it out, but it’s probably more secure if you’re worried about anyone doing anything to your Earnably account. From the point going forward, the best option to begin with is to make use of the promotional codes. Whether using what’s granted by email or via the help center, you’ll want a code to boost your point gain in the slightest. Once you’ve completed this task, you’ve completed the first portion of the new user experience before the daunting offer task. In review, once you’ve actually made an account Earnably does what a lot of reward sites do. The need-to-charm wears off a little, and it expects users to go with the rush of having joined. There’s a few retention programs in effect but the points offered by these are so minor that they won’t clearly incentivize the user to stay if they’re very set on leaving. At a glance, I don’t think Earnably has worked on the instant consumer satisfaction issue that reward sites always seem plagued with. As I refresh my points and still get nothing, I know that I may or may not receive them over the course of several days. I might even have to try to go after support in the near future for the elusive points if I choose to care enough. I had hoped my first impression of the site would break from the idea that I should just be happy with what I could get and hope I can manage to get one reward from what time I’ve sunk in. Of course, in all fairness this is done before actually doing any offers. Still, when conducting a review it seems appropriate to note that the satisfaction issue could be much improved especially from the get-go. I’ve also used reward sites that at least start the user out with some points versus sitting on an empty zero like with Earnably. Those sites still turned out to not be legitimate, so we won’t necessarily count this as a mark against except on user satisfaction. We’ll continue to examine if the offers and point-earning sections of Earnably do anything to improve upon these first impressions. The offer wall stands out first with an offering of sixteen different partners. There are four top partners at a time, and they’re all respectively colorful and designed logos meant to inspire trust and get the user to click on them. The user will not see anything else on this page besides an advertisement meant to generate click revenue for Earnably. It’s unrelated to your actual earnings, and it follows the standard scam route of baiting users to click by promising the ability to earn grossly high wage rates from home or that the user has won some prize. These appear since Earnably so aggressively tells the user to disable their ad blocker or else various offers will not work (and even threatens that they can obstruct crediting). Given crediting already seems to have issues, the inclusion of a deliberately unsafe set of circling, clickable ads came as a demerit to Earnably’s credibility. Many pay-to-be-rewarded services function on the principle of generating new users to appear actively used and reputable. However, the warning sign usually comes once the user logs in and sees these deliberately questionable approaches to get even more income than just pushing the user to work with their supported partners. With this said, let us look at exactly what dealing with the offer wall results in. I decided to begin with Peanut Labs as it was the first recommended partner, and the word lab usually suggested it had some more backing from prior experience of dealing with surveys. As expected, I had to fill out a very detailed survey about all aspects of my life (age, income, education, car, grocery shopping, electronics owned, and more) in order to qualify for survey offers of varying points. In terms of points awarded, it was nothing like the more exciting rates found on the Earnably page prior to registration. The surveys offered ranged from ten to twenty minutes with the average coming out to be fifteen minutes. The actual points awarded were also lower on the spectrum for the time committed to the act. They could range between 33 to 68points, but the average rate coming out was more like 35 minutes. However, if you look past the lower rewards, the actual survey experience doesn’t function much better. You have to pre-qualify as is standard for a variety of surveys despite filling out your profile. None of these pre-qualifications seemed really relevant to the questions that were just filled out, so I had to somewhat question what the purpose of filling out the profile with extensive questioning was. With the wide net questions, it can be a bit frustrating as you may not qualify simply because you don’t know what the survey is asking for. For instance, I had multiple surveys offered to me that asked if I was aware of a list of websites. If I knew all of the websites, I did not quality for the survey (which seemed slightly counter-intuitive as usually surveys are gleaming for feedback especially of major sites). Still, the same survey pre-qualifiers would stay up (albeit at different point values), so if you’re determined you can eventually guess what it takes to qualify. I ended up taking a ten-minute survey that was supposed to net me with 33 points. I was asked if I knew a variety of websites, I only checked one, and I was given a survey that had nothing to do with any of the mentioned websites at all. Instead, I was granted a survey that had to do with my cellphone provider, coverage, and whether it was a 3G or 4G connection. It eventually took an odd turn into probing how I felt about if a 5G connection were to exist along with opinions on practical application. I answered it seriously, and I took the time to respond accurately to each question. What do you think the end result was? I was awarded one point at the very end for not qualifying for the survey. I’m not sure how the site can justify not awarding the points after stating the user has qualified and actually investing the time. another survey, which I qualified for, based off did I recognize certain pharmacy names such as CVS, Rite-Aid, and Wal-Greens. The resulting survey was broken into two sections. The first section was about a five-minute one-page survey about televisions and what one might want to purchase a future buyer. The second section was about a twenty-minute survey regarding viewpoints on companies that have nothing to do with pharmacies. I expected to not be granted the points since the survey was again not on the topic that I was being screened for, but I did receive twenty-four points for the survey. It wasn’t particular efficient for my time in feeling especially given the higher point values suggested on sign-up, but they were instantly awarded. Additionally, despite having bonuses active on my account they were not awarded at this time. I did check my code page, and it did alert me that I had earned 6.75 points that would be awarded on the first of January. Despite the headache with getting access to some surveys and the unclear reason why a completed survey did not award the promised points, I was able to find a functional result with Peanut Labs. If you’re an experience and quick survey-taker, you can make it work for you a little bit faster. However, if you’re a skilled individual, I can’t see a scenario where you’re benefiting at all from the time investment with the unreliable results here. For the time invested, I’ve made less than one dollar in earnings due to how rewards are churned out. One hundred and twenty five points equal a one-dollar credit at Amazon or PayPal, for instance. You could theoretically get lucky with a survey as a perfect fit that awards some sizable points, but it’s pretty clear that you can’t generate anything sustainable relative to other, better survey sites. Still, Peanut Labs did offer some other additional offers that seemed worth looking through. Without getting too hung up on the disappoint survey results, it seemed best to look at what they had available. Offers for the most part generate fewer points than surveys. This stands true if you’re not signing up for a new Hulu account, donating to the Nature Conservatory, or buying skin care products from Proactive at least which award between three to five dollars worth of credit on the site.So if you’re looking to gain money, you’re not exactly gaining any by doing these as two of the three require money spent immediately. The next highest point offers that are in the thirty to forty-point range involve the user to either install software on their computer or give out their address to be shipped a sample with a follow-up survey required. Overall, you’re not moving away from surveys all that much with the variety of offers that actually award points. If you don’t mind signing yourself off for an extensive amount of junk material, you could go this route. However, I can’t in good conscience recommend the user even bother to do anything but the surveys at this point for Peanut Labs. It’s a very questionable affair overall, but you could earn a few dollars if you enjoy just doing it casually on a daily basis for your own leisure. With this said, I did want to check if at least the second primary partner did anything better. In comparison to Peanut Labs, Adscend Media begins with a general featured category.Until you fill out a nineteen-page set of slides gathering personal information, you’ll see a mixture of app-based download options mostly. Once you do, you’ll find it flooded with survey option potentials. The point values were a little more of what the main Earnably site suggested.There are some high thresholds where you could almost earn a dollar per half hour. However, there are also a number of low thresholds per time such as in the low forties for twenty-five minutes or more. It’s a bit of a gamble on what you’ll exactly end up with since there’s not fully qualified still for any of these surveys, but you’re not going to experience any weird prescreening topic shifts like with Peanut Labs. Streaming for Credits: A Better Option? With that said, Adscend Media does introduce some more options like two to four point rewards for looking at a slideshow. Additionally Earnably’s highly suggested streaming options appear with EngageMe.tv and Smores. TV as two streaming services offered where you receive points after watching a set amount of ads. It’s 0.7 points every three adds flat-out, but you can select a higher adoption if you’re planning to watch a lot of ads to hit the set 2.8 points. There’s not a lot of meaning to the actual point divisions besides the illusion of choice. Additionally, you can choose topics such as viral videos,entertainment news, app trailers, or food videos if you’re very concerned about what you’ll be watching in between the ads. But it’s all about the ads, so you’re mostly going to just be letting the videos run as you try to get your passive income. Do be warned that if you indulge in any of the streaming video additions as you can get into more crediting issues. If your Internet drops connection, you can break the ad chain. Additionally pop-up blockers can interfere with crediting. The rate of earning overall is again much worse than advertisements once again.However, in terms of passive income and with the right set-up, you can potentially earn in a way that’s less attention consuming. Still, whether or not that would ever be worth it is ultimately up to if you like this sort of practice. With that said, I want to offer a few closing remarks on Earnably. For the most part, I’ve been pretty disappointed in Earnably. It does nothing to break the typical business mold of earnings sites that care only about their numbers and do little in the way of customer incentives. There’s a good showing of pretend care, but the earnings rates are so statistically low that it’s nigh impossible to recommend unless you really just have a love for the niche of this kind of fiscal earning. Additionally, with the issues with some points randomly not appearing on certain offers whether due to ad blockers, time-gating, or the automated systems in play there are potential stressors even if done leisurely. If you want to earn money responsibly, you can find many different survey sites that are more legitimate without going through a third-party company that has partnered up with companies that solely focused on that venture. At this time, Earnably can work, but you’re probably going to be working at below minimum wage for a few tiny reward cards. It’s not considered scam territory, but you could do immensely better with your time and added research.